The basic function of lubrication equipment is to dispense oil or grease. The actual methods for dispensing vary widely and often require study and comparison. 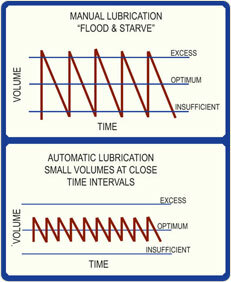 The following lubrication tips provide assistance in understanding and selecting lubrication equipment. A constant level lubricator is used to maintain the oil level in a piece of equipment that naturally depletes fluid through use, wear, friction, or evaporation. Bearings, gearboxes, and pillow blocks typically require oil replenishment, especially when used in environments that are dirty or where heat is a factor. Typical industries that utilize constant level lubricators include paper mills, cement plants, coal handling facilities, wastewater treatment, nuclear plants, and mining operations. A constant level lubricator operates without a power source or moving mechanical parts. It relies on the liquid seal principle to maintain a fixed liquid level in a bearing housing or gear box. It can function reliably over long periods with little or no monitoring. When piped to a bearing, gearbox, or similar piece of equipment, the height of the constant level oiler is critical. The oil level line must align with the optimal fluid level in the main equipment. The air vent on the lubricator should be piped into the main equipment above the fluid level to equalize the pressure between the lubricator and the main equipment. For more information on constant level oiler installation and operation, view Oil-Rites complete Constant Level Lubricator Manual. To browse available constant level oilers in our online catalog, click here. Lubricant is typically most effective when applied in very small amounts over frequent intervals. Even state-of-the-art manufacturing facilities may still rely on a less productive method of applying oil or grease in "lump sums". Both the type of equipment and the manpower available may be contributing factors. The cost of lubricants has traditionally been minimal and so little stood in the way of using as much as possible in a single application. "Err on the side of caution" has been a mantra in lubrication, which is solid advice if a more efficient alternative is not available. However, using large doses to ensure there is enough lubricant has its disadvantages as well. While the machinery may be adequately lubricated at first, the lubricant will dissipate with time and the machinery is likely to be "starved" of lubricant before the next scheduled maintenance. In addition, large-dose lubrication often creates an excess of fluid that may create slippery floors, oily surfaces that attract dirt, contaminated product, and unnecessary exposure to the environment through rags, mops, and drains. 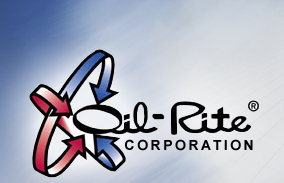 Oil-Rite Corporation equipment can be selected to take into account the machinery, type of lubricant, the maintenance schedule, and the level of involvement from the operator. A very small amount of lubricant typically accomplishes the objective of reducing friction, heat, and wear. The challenge is maintaining that very low level as the lubricant is naturally diverted or pulled from the critical surfaces. Most gravity lubricators have flow rate control and brushes can be very useful in evenly applying lubricant. These methods are simple and often effective. In more automated, unattended, or high speed applications, a gravity lubricator may require too much monitoring and may not be precise enough. Oil-Rite Corporation developed the PurgeX pump as a way of dispensing very small amounts of lubricant. PurgeX is extremely precise and reliable, yet simple to install and operate. It can be integrated into the logic of existing machinery or supplied with logic controls. It eliminates the need for constant monitoring and adjustments typically involved with achieving optimal lubrication. Dirt in oil tends to defeat the beneficial properties of the lubricant. Dirt can appear to travel harmlessly within the oil. But it often acts as an abrasive as it passes through the small areas between bearings, gears, and pivot points. Over time, dirt tends to build up on surfaces and prevent lubricant from reaching critical areas. This contributes to friction, heat, and wear. Keep stored fluids in their original containers. Use the original cap or cover whenever possible. Develop a procedure for who refills plant reservoirs and how the refilling is done. Examine any funnel or fill bottle for dirt or dust before using it. Be aware of the environment where reservoirs are refilled. Accumulated dirt may drop into the fluid while removing the lid. The reservoir may be below an area where metal shavings or other residue may tend to drop. The debris may be part of the normal manufacturing environment and simply go unnoticed while refilling. Inspect fluid condition before refilling. Dirty fluids dont tend to flush themselves out. Some settling of dirt may occur in the corners and low areas of the reservoir. In some instances, this acts as a sort of passive filtration. However, agitating the liquid during refilling can direct contaminants back into the main flow of the reservoir. Use a reservoir filter to stop dirt from reaching machinery. 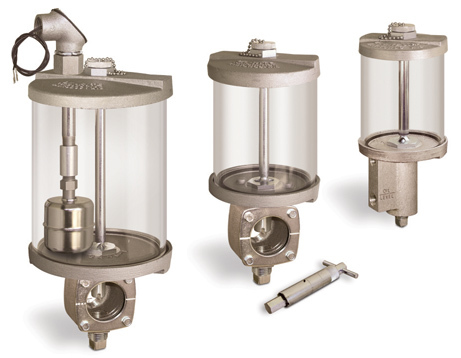 A 100 mesh or 40 micron filter is usually sufficient to trap contaminants. This is especially important when recirculating oil. Clean fluid will also help insure that the lubrication equipment functions as it is intended. Dirt can easily cause irregular dispensing and deprive machinery of critical lubrication. In this way, dirt can have the effect of damaging machinery without ever reaching it. The purpose of chain lubrication is to provide oil at all load carrying points where motion occurs. This reduces friction, minimizes wear, stretch, and corrosion, and can even reduce power consumption. As an additional benefit, brushes also act as a cleaning mechanism by sweeping away dirt accumulation and old lubricants. A critical step in achieving effective chain lubrication is selecting the proper brush. One of the first considerations in choosing a brush is to determine the bristle material: nylon or stainless steel. Nylon bristles are suitable for low to high speed applications up to 400 RPM (small sprocket measurement), and temperatures under 250°. Applications in high temperature conditions require stainless steel bristles. Stainless steel wire wheel (roto) brushes are a particularly effective method of lubricating in high temperatures, the roto brush is rotated by the chain and transfers oil from a pan or reservoir to the underside of the chains. Select a brush size that is wide enough to almost cover the chain width. Roto brushes are available in a standard width of 1", round brushes are available in sizes ranging from ¼" to 1 ½" in diameter, and flat brushes are available in sizes ranging from 2 ¼" in length to 11 ¼". Whenever possible, position the brush on the inside surface of the chain, so oil will penetrate chain links via centrifugal force. Damage to the brush can be prevented by positioning the brush at a location on the chain where there is minimum sway. Occasionally rotating the brushes and adjusting them for wear will ensure continued performance. Most brushes are adjustable to accommodate up to ½ of wear and all can be easily and cost-effectively replaced.